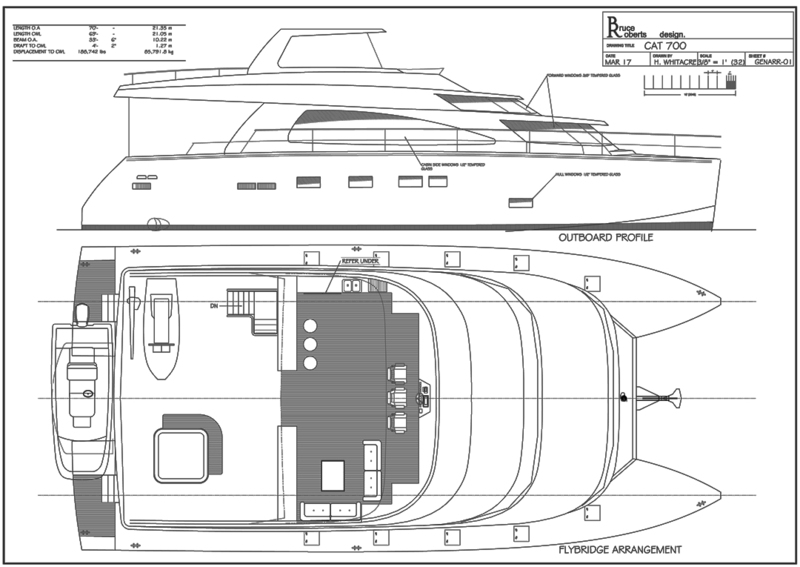 Each STUDY PLAN contains ALL the construction drawings for each material - FIBERGLASS as applicable to the particular boat plan - with up to 50+ sheets per plan! Lists of materials - Technical information - Numerous construction drawings are all included. You can view & print the drawings in full or in sections. BUILDING PHOTOS are included in the study plan package. PLUS you receive a FREE (value 79.95) 1400 PAGE, ALL COLOR .. e-book BUILD YOUR OWN POWER BOAT. Or pay my bank transfer - Contact Bruce for details. LOA ... 21.35.00 m / 70'-0" LWL 21.05 m / 69'-0" Draft........1.27 m / 4'-2"
These new fiberglass plans & mold patterns feature the well proven Bruce Roberts 'EZI BUILD' cheap mould boat building methods that can be handled by any person with some basic handy-man (or handy-woman) skills. 70ft / 24.34m ( Smaller sizes available on request ) Here we show our latest Euro Power Cat 70 / 21.34m which is custom designed for an experienced client who wanted something special which was capable of extended cruising under power. This Power Cat is capable of speeds in excess of 30 knots while also being happy at displacement speeds - a great all round fiberglass power cat. The Euro Cat 700 is ideal as a luxurious family world cruiser or as a Charter Cat that would find a many customers world-wide. Building features the Bruce Roberts Fiberglass cheap mold & panel building methods which have been well proven in several other of Bruce's motor yacht and catamaran designs. Here we see the General Arrangement profile and fly-bridge plan view. 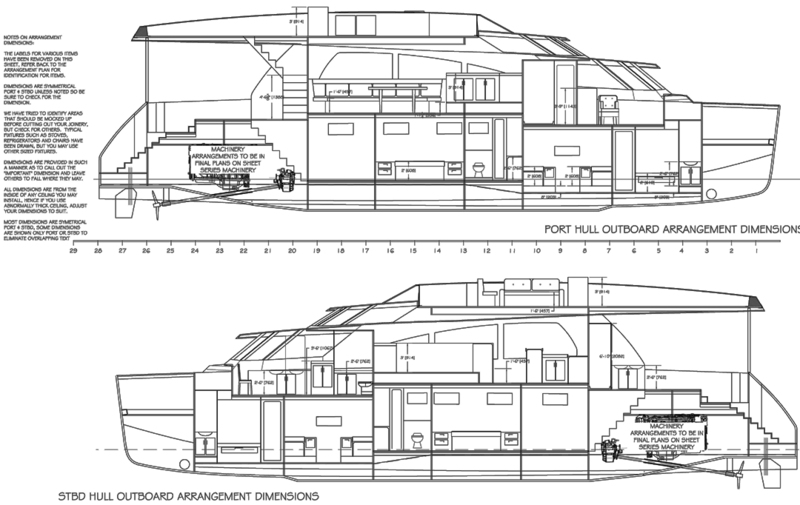 Here is shown the main decks and salon in plan view. 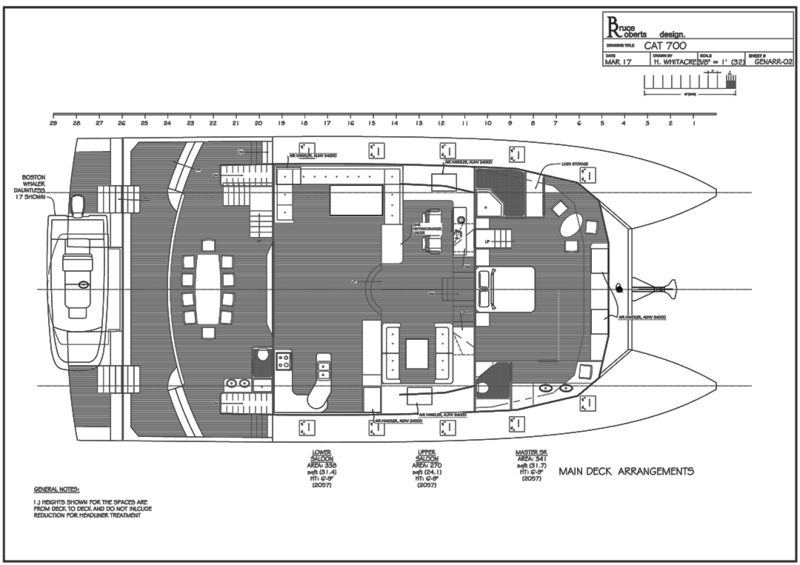 Here is shown the below decks and accommodation in plan view. 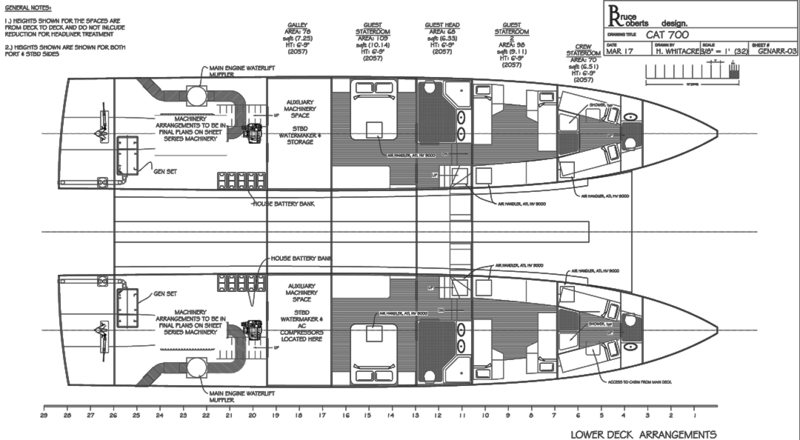 At left is one of the several sheets showing in profile below decks & accommodation plans. construction and engineering sheets and written building instructions. 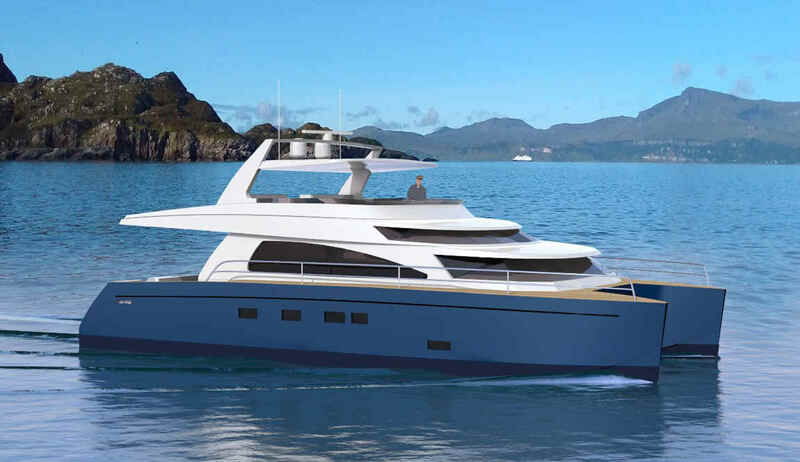 LATEST NEWS FROM CURRENT BUILDERS & OWNERS OF BR DESIGNED BOATS.